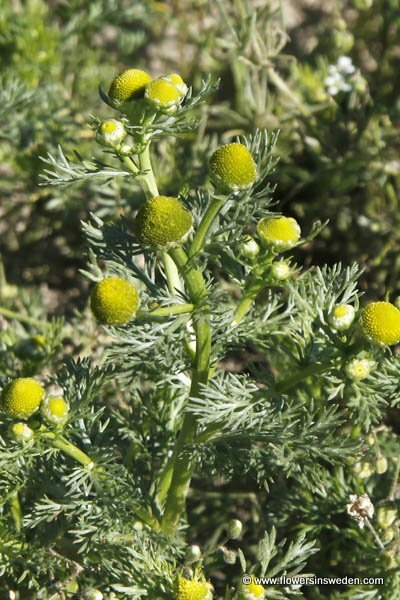 Stems: Height 5–30 cm, erect, multibranched, hairless, glabrous or glabrate to sparsely hairy. 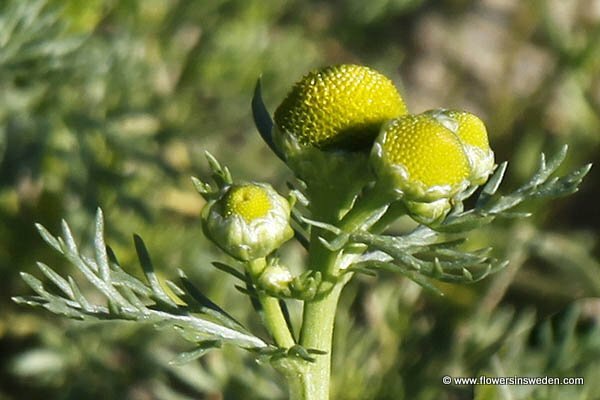 Flowers: Cone-shaped flower head, composed of dense-packed yellowish-green corollas, lacking ray-florets (no petals). Derivation of the botanical name: br>Chamomilla, Greek χαμαίμηλον, chamaimēlon, "earth-apple"; χαμαί chamai, "on the ground"; μήλον mēlon, "apple", referring to the smell of the blossoms. 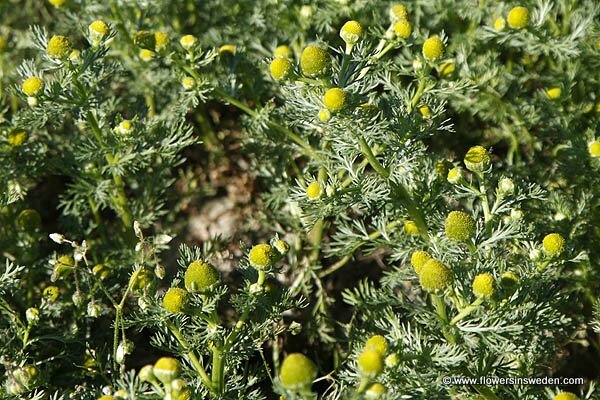 Matricaria, Latin matrix, "the womb," the plant once having been used as a cure for female disorders. discoidea, δισκοϛ discus, a "quoit, discus," -οειδηοϛ oideus adjective suffix for nouns: like, resemble; disc like. The standard author abbreviation Pursh is used to indicate Frederick Traugott Pursh (1774 – 1820), a German-American botanist. The standard author abbreviation Rydb is used to indicate Per Axel Rydberg (1860 – 1931), a Swedish-born, American botanist who was the first curator of the New York Botanical Garden Herbarium. The standard author abbreviation Porter is used to indicate Thomas Conrad Porter (1822 – 1901), an American botanist, theologian, educator, and poet. The standard author abbreviation Britton is used to indicate Nathaniel Lord Britton (1859 – 1934), an American botanist and taxonomist who founded the New York Botanical Garden in the Bronx, New York. The standard author abbreviation Buchenau is used to indicate Franz Georg Philipp Buchenau (1831 – 1906), a German botanist and phytogeographer.